That is, by far, an absolutely wonderful centerpiece, but I think you need to have your daughter’s photo alongside it for full effect. Yeah that’s right, blame it on the kid…we know that you couldn’t wait until the icing set…or are you going to blame it on the cats??? Don’t forget to ice the hammer, as well. And lay some action figures in among the wreckage for pathos. We bought that same kit last year, and something similar happened. It’s the icing. I am reminded of the model airplanes of my youth, which had a similar appearance divergence between box art and finished product. don’t let her work on your car! thanks for the chuckle. Nicely played! It seems Ms. Athena has inherited her mother’s good looks and her father’s berserker tendencies. She’ll be quite the femme fatale in a few more years. I mean, she’s already a homewrecker! Well, see, you ordered the post-apocalyptic gingerbread house kit. Does that come with the knife-wielding tween or is that an add-on? #9 – MG – BEST caption for a picture EVAR “>. Always buy the one that’s pre-constructed. It never works to do it yourself. I do love the effect that you got by putting sprinkles and candy all over the demolished house. The hammer was a nice addition along with the classic look on your daughter’s face. She clearly needs to spend more time studying with Norm Abram… who would note that she is not wearing her safety glasses. Did that not go through right? Completely awesome. I’m stuck at work on Xmas eve and this made me LOL. It’s like the gingerbread house after the tornado hit. You could add a gingerbread tree with a fisher price cow in the branches…and the picture with Athena is completely priceless! I’m pretty sure that’s a Detroit gingerbread house. Very realistic, though a bit more structurally sound than the real deal these days. Probably worth more than the real deal, too. Ahhh, 2009. Nice knowin’ ya. Oh yeah, you think it’s funny *now*. I agree. It needs a few zombies milling around… and is it me, or does there seem to be less of your house than the one on the box? I swear they never give you enough pieces..
Well, instead she made abstract art! Quite the budding artist you have their. 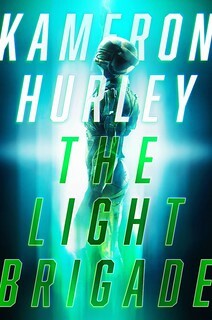 That picture strongly reminds me of the one of yourself at the Hugo Awards Ceremony, the one with your beautiful wife looking indulgently upon you. Methinks Athena takes after you: like father, like child. I hope the gingerbread was at least delicious? Here’s some context. 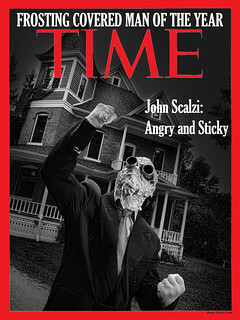 When my oldest son was in 5th grade, the week prior to Christmas break was taken up with the “economics project” in which the students build something to sell; it took hours and hours of family time to pull this off; my wife was working midnights; then, two days later we’re told, on the last day we’ll be making gingerbread houses, here’s the recipe you need to use. To say my wife went off on the 5th grade teacher is to understate things. 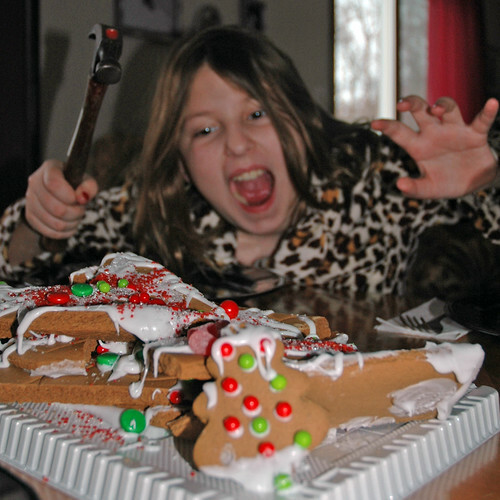 GIngerbread houses are forbidden in our household. There was a Calvin And Hobbes about that, in which Calvin explained to Hobbes that his model jet fighter had been hit by anti-aircraft fighter. Hobbes noted it seemed to happen a lot. I think it looks just lovely. Sort of a Deathstar “After” picture. That there is an icing problem, that is. It didn’t set up. Next time, ignore whatever it is they had you do and go to the Internet to look up a recipe for royal icing (here is Lord Alton Brown’s: http://www.foodnetwork.com/recipes/alton-brown/royal-icing-recipe/index.html ). Assemble the house’s four walls. Let dry. Stick the roof on. Let dry. NOW decorate. 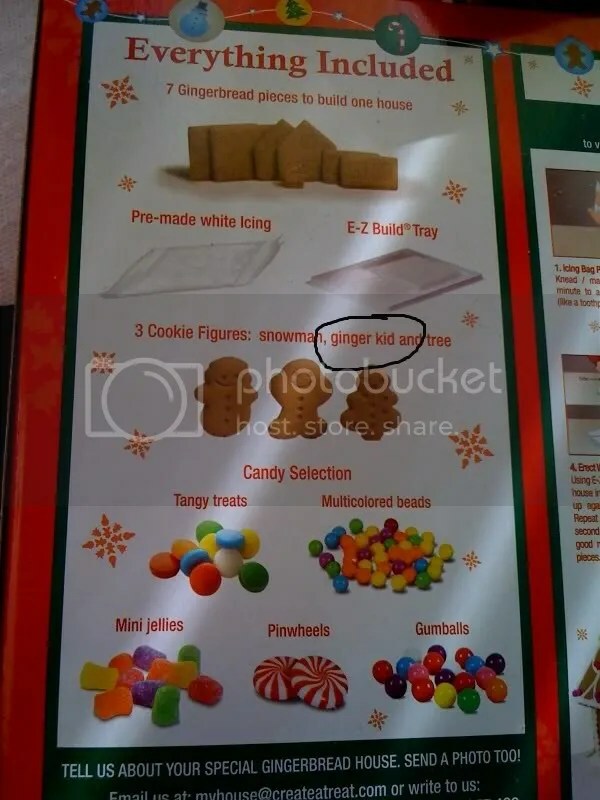 You don’t have to use gingerbread, by the way. My mother always used graham crackers. Good to see that my family’s not alone in gingerbread major FAIL. We tried, VALIANTLY, to make a nice gingerbread house this year. But try as we might ours ended up looking like yours. Fine, I say – it tastes just as good and I don’t have to feel guilty for ‘ruining’ my perfect project when I eat it. Merry Christmas and a Happy 2010 to all the Scalzis! Go girl! Didn’t just smash it by hand or grab something handy. Actually used the proper tool. Alrighty then. Merry Christmas John, I wish you and your family all the best! 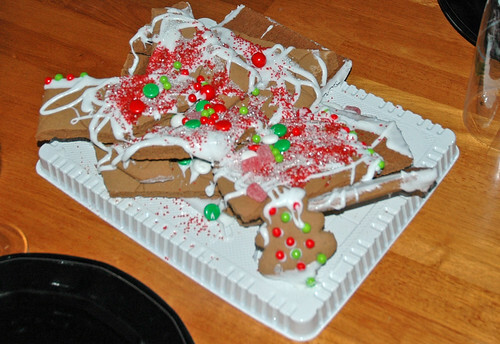 I was just talking to my mother today, and she reminded me of the last time that we all tried to make a gingerbread house together. My wife and I had successfully made one the previous year, so we decided to all get together and make one at my parents’ house, too. We make our own gingerbread — and left in in the oven just a bit too long. Got just a little overcooked. Then the icing wouldn’t set up. And we ended up with a pile of burned gingerbread sorta leaning against itself in a heaped mess. My mother looked at it, decorated it with candies and icing and all the rest, made a little sign that said “FIRE SALE” and put it in the front yard area of the “house”, and used the mess as a centerpiece. Merry and happy and all that stuff. Our almost 11 year old and her aunt each make a house on the day after Thanksgiving. On the day after Christmas, they will demolish them with hammers in the front yard. It’s a tradition. Happy holidays to your whole clan and you! Dropping by to say Merry Christmas to you and yours, John. May you have big presents :). We also have the same gingerbread house kit get-together over here and yeah, too many cooks destroyed the house too. And, my dogs took bites out of it. Poor gingerbread house. 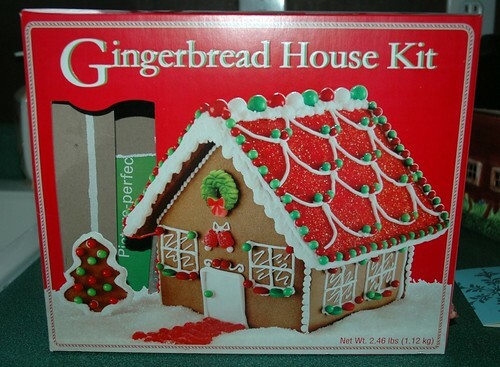 Good grief, you don’t make a gingerbread house out of a KIT. No wonder it came out a little suboptimal. Do, or do not. There is no KIT. When I was in the Cub Scouts one of our projects was to make Christmas houses out of sugar cubes, with mortar made from confectioner’s sugar dyed pink with food color, and a cardboard roof. You might try that as a project next year. How timely. We seem to shop in the same places, and end up with similar results in gingerbread construction projects. I think I bought the same kit last year. Of course, they forgot to add superglue to the “ingrediants required” list. My kid tried making her own gingerbread house this year, by baking gingerbread bricks, then mortaring them together with icing. It turned out… SOMEwhat better than yours. I think. It stood up for a while, at least, mostly.